Hanoi Impex Pvt. ltd. - SPONGE IRON Steel, because of its versatile properties and its recycling possibilities, is the basic material for sustained development in modern industrial society. It enjoys a broad range of uses in almost all important sectors of industry, such as apparatus and machinery manufacture, bridge biulding, steel-framed building construction, power and environmental engineering,transportation, and the packaging industry. Steel making is a complicated processes involving many stages and yielding thousands of by-product. Steel can be produced either from steel scrap or sponge iron. The process used for the manufacturing of iron & steel has a bearing on the cost of production & the quality of the steel produced. 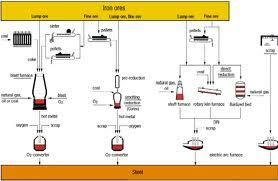 The Iron Making process The first step in the steel making process is producing iron from iron ore. The process is called the iron-making process. 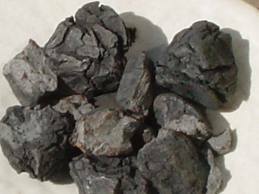 Three different methods can be used for the production of iron from Iron ore. They are: 1. Coke-Ovens -Sinter-Blast Furnace (BF) Route 2. Direct Reduction Technique 3. Smelting Reduction Technologies The Steel Making Process The second stage in iron and steel making is the steel making process. Generally two types of techniques are adopted for steel making. They are the Basic Oxygen Furnace (BOF) type and Electric arc furnace (EAF) type. Basic Oxygen Furnace Technique (BOF) The Basic oxygen furnace is used for producing steel from the refined iron. Hot metal from the Blast furnace, which is a pear shaped furnace or reduced iron from the smelting plant is fed in to the Basic Oxygen Furnace (BOF) after pre-treatment to remove undesired elements like sulfur, silicon or phosphorous. Molten Steel in liquid form is obtained. Impurities go out in gaseous form and as slag. The liquid steel produced here is called crude steel. Electric Arc Furnace (EAF) Steel scrap or Pig iron or Sponge iron is used as the raw material in this process. Here the raw material is melted using heat generated with the aid of an electric arc produced by graphite electrodes. Here again the output is crude steel. The crude steel produced from the above said processes are either used for producing ingots or fed in the continuous casting process cycle. Ingot-definition- Molten steel cast in vertical cast iron moulds intended for rolling after heating in two stages i.e. in a primary mill and then in a finishing mill. engineering,transportation, and the packaging industry. quality of the steel produced. The first step in the steel making process is producing iron from iron ore.
be used for the production of iron from Iron ore. The second stage in iron and steel making is the steel making process. Generally two types of techniques are adopted for steel making. They are the Basic Oxygen Furnace (BOF) type and Electric arc furnace (EAF) type. The Basic oxygen furnace is used for producing steel from the refined iron. Hot metal from the Blast furnace, which is a pear shaped furnace or reduced iron from the smelting plant is fed in to the Basic Oxygen Furnace (BOF) after pre-treatment to remove undesired elements like sulfur, silicon or phosphorous. Molten Steel in liquid form is obtained. Impurities go out in gaseous form and as slag. The liquid steel produced here is called crude steel. 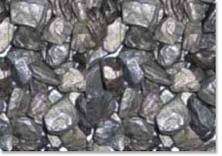 Steel scrap or Pig iron or Sponge iron is used as the raw material in this process. Here the raw material is melted using heat generated with the aid of an electric arc produced by graphite electrodes. Here again the output is crude steel. The crude steel produced from the above said processes are either used for producing ingots or fed in the continuous casting process cycle. Ingot-definition- Molten steel cast in vertical cast iron moulds intended for rolling after heating in two stages i.e. in a primary mill and then in a finishing mill.